In the year 2086 humanity faces a new threat, Extra Humans. The government is struggling to cope with the growing number of mutants, aliens and supernatural beings who are living amongst us. People are beginning to panic and so, in 2050, the Department for Extra Human Affairs was established with a remit to try and contain the problem. 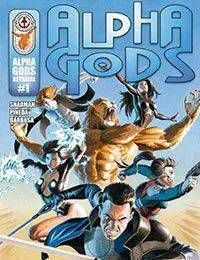 By 2086 the situation has escalated, so they have formed a new rapid response strike force, the Alpha Gods. Who better to police the Extra Human community than Extra Humans themselves?<br />Collected in Alpha Gods: Betrayal.